Congratulations on pursuing your passion and taking the leap to become a home-based business owner! Starting your own home business can be an exciting albeit nerve-wracking time. The good news is the odds of success are in your favor. Today, there are approximately 38 million home-based businesses being run throughout the US alone, and 70 percent of these have managed to stay in operation for at least three years. Even more inspiring is the fact that these same home businesses generate over $400 billion each year, making them a vital part of the overall economy. With so much at stake, home businesses need to be protected just like any other business entity. Whether you plan on working for yourself around the clock or only a few hours a day, proper insurance coverage is a must in order to protect your business and assets should anything unexpected occur. 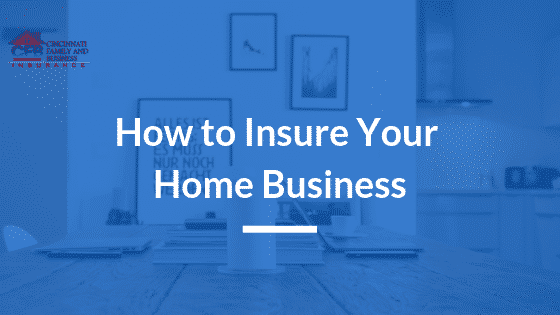 If you’re running a home-based business, the type of business you’re operating, the amount of inventory you have, and your sales volume are just a few of the many factors that will affect which home business insurance coverage is best for you. However, with so many intangibles to account for and insurance options out there to choose from, how do you select the right coverage for you and your home business? Fortunately, we’ve broken the selection process down to three simple steps. Keeping reading to learn how to choose the right coverage, insure your home business, and begin protecting your bottom line today. Many insurance carriers provide several different insurance options for home-based businesses. Your coverage needs will vary depending on the type of home-based business you’re running. For example, if you’re a freelance writer or graphic designer with no tangible goods other than a computer and software, the amount of coverage you will need will differ from someone selling custom t-shirts with a room full of inventory. A simple home owner policy endorsement may do the job, or you may need several individual business insurance policies. Perhaps a businessowners package policy is a better fit? Here’s a look at each of these options and how they apply to home businesses like yours. While homeowner’s insurance is designed to cover homes and not businesses, it may be suitable for your home business needs if you only need a small amount of coverage for business property. More than likely, incidental business property is already covered under your base policy. However, it provides zero business liability coverage. A business endorsement can solve this dilemma. Basic business-related property endorsements typically provide up to $3,000 of coverage for business property in the home and only $250 of coverage when away from the home. Liability endorsements only provide coverage in the event someone is injured on your property, and they are usually only available to home-based businesses with very few business-related visitors. Unfortunately, neither provide professional liability coverage and offer protection in the event of a lawsuit. There is also no comprehensive coverage option for loss or damage to off-site business property, loss of records, and loss of income due to extensive damage to your home resulting in an unusable space. With loss of income coverage, if a covered home event like flooding or a tornado forces you to pause in-home operations, you will receive funds to pay employees and bills for up to 12 months. If you need this or even more coverage to fully insure your home business, a businessowner’s policy may be a better option. A businessowner’s policy, or BOP, is designed for home-based businesses of a larger scale. If you need to protect $10,000 or more of business property or have multiple types of liability coverage, you should consider a BOP. Aside from the added protection, one of the main advantages of a BOP policy is the ability to have specific liability coverage for your type of business. However, it’s important to note that a BOP typically only covers any damages caused to others as a result of your product or service. It doesn’t cover the actual product or work itself. It’s also worth pointing out that BOPs don’t provide any health, life, disability, or worker’s compensation coverage. So, if you have employees and want to cover your bases, it may be worth looking into these types of coverage as well. Similar to homeowner’s insurance, personal auto insurance is not designed to provide coverage for business use. Therefore, if you have a company-owned vehicle, you need commercial auto insurance. With commercial auto insurance, you can protect both company-owned vehicles and personal vehicles used for business. Commercial auto policies also generally cover coverage gaps between personal auto and business liability policies. Whether you travel daily for your business to and from job sites or once a week to mail documents and packages, a commercial auto policy can make sure you’re covered in the event of theft or an accident. Independent insurance agents specialize in helping people just like you find the right home business insurance coverage. So, if you don’t already have one for your home or auto, find one. Your independent agent will help you secure the best coverage at the best rates available. However, no ordinary agent will do. To get the right coverage for your needs, it’s important to work with an agent with experience insuring your specific type of home business. Whichever agent or type of home business coverage you choose, it’s a good idea to regularly review your policy and discuss any changes with your agent. Similar to the way you would review your homeowner’s policy when adding a bathroom or addition, you’ll want to increase your home business coverage as you increase your inventory, add additional work vehicles, and so on. You may also want to discuss umbrella policies with your agent. The right agent will offer the right advice to provide you with superior protection both now and in the future.